International Space Rock/Metal collective Space Mirrors was founded in 2002 by Russian multi-instrumentalist and producer Alisa Coral. Since that time Space Mirrors released three albums and featured many talented musicians from all over the world. 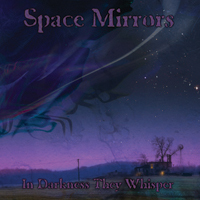 Space Mirrors music is often inspired by Sci-Fi, alien conspiracies and esoteric topics. In 2011 Alisa Coral started composing the new album, called "In Darkness They Whisper". The songs of the new album are inspired by the metaphysical, cosmological and occult concepts developed by H.P. Lovecraft in his stories. The music combines elements from heavy and melodic space rock to epic/prog metal. It has more focus on delivering fine crafted tunes but not forgetting initial space rock fundament. Artwork is once again created by Kevin Sommers. The new line-up includes musicians from Russia, Italy, UK, USA and Denmark, including the legendary Nik Turner (sax, flute) and Alan Davey (bass) of Hawkwind fame, the space/prog rock virtuoso Cyndee Lee Rule (Spaceseed, Osiris the Rebirth) on violin, on guitar Massimo Arke of Opposite Sides & Hortus Animae, Fabio "Amon 418" Bartolini of Hate Profile & Hortus Animae, John Pack and Allen Welty-Green of the known American space rock band Spaceseed, Sparky Simmons (Acid FM), Bjorn Jeppesen a synth player well known for his electronic music Nattefrost project, and Martyr Lucifer (Hortus Animae) on vocals. The influences and stories of Lovecraft reveals itself on this album in a haunting suite of 8 acts; Chambers of Azatoth, Through The Dream Lands, From Dylath-Leen to the Dark Side Of The Moon, Moon Battle Of Cats, To Ngranek, Face Of God, Leng/The Crawling Chaos, and finally, Morning In Marvellous City! The colorful artwork is made by Kevin Sommers, and is featured in a 12-page booklet! The album will be released on Transubstans Records in the beginning of August, 2012!